Experienced Former international Shooting guard Michael Bain (185-SG-85) had an amazing evening in the last round for league's leader Giants and that's him to receive a Interperformances Player of the Week award for round 11. 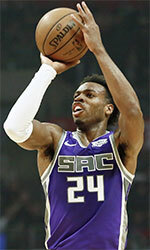 The 33-year old shooting guard had the game-high 20 points adding seven rebounds and five assists for Giants in his team's victory, helping them to outclass Pirates (#7, 3-7) with 26-point margin 90-64. It allowed Giants to jump to the first place in the Bahamas NPBA. They maintain a perfect record without any lost game in the league. The season is already in a full swing and Giants still have not lost a single game, getting all 9 victories. Bain has many years of experience at Giants, through which he has constantly improved. Bain has impressive league stats. He is in league's top in points (3rd best: 19.0ppg) and averages solid 1.1bpg and 65.4% FGP. The second most remarkable performance in last round's games was Kenneth Pratt of Regulators. Pratt impressed basketball fans with 29 points, 8 rebounds and 3 assists. Bad luck as Regulators lost that game 79-92 to slightly higher-ranked Shockers (#5, 5-5). Regulators managed to keep the same 6th spot in the standings. His team is not often considered as one of the league's best with a mere 3-7 record. Pratt is one of the most experienced players at Regulators and has a reputation of one of team's most reliable players. 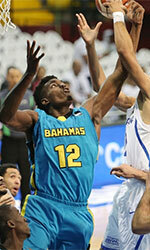 The third best performed player last round was Kemsy Sylvester of Bahamas Univ. (#3). Sylvester showcased his all-around game by recording 27 points, five rebounds and four assists in the last round. 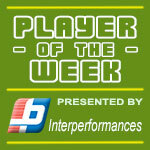 He was a key player of Bahamas Univ., leading his team to a 92-86 win against #2 ranked Stingers in a game of the week. Bahamas Univ. needs these victories very badly if they think about getting closer to top teams. Their record at this point is 8 victories and 3 lost games. Sylvester has a great season in Bahamas. After only 7 games, he made it on the list of the league's leaders in points with 20.4ppg (2nd best) and assists with 4.3apg (4th best). He also has 3.4spg, 1.3bpg and FGP: 63.6%.